Even the most experienced drivers aren’t immune to hitting a curb and your should accept that sooner or later, your car will too hit a curb. The issue here is that there is no way to determine the extent of the damage it can cause without having it checked out by a professional. The factors to consider are the height of the curb, the speed at which you were driving, and the angle of the impact. A professional mechanic can check your car and assess the damage properly. There is always the risk that you will hit the curb when out driving. Depending on whether the impact is in the front or the rear, your car can suffer considerable damage. Sometimes, curbs appear out of nowhere and it is impossible to avoid the collision. If this occurs you should visit a professional mechanic as quickly as possible. Hitting the curb can damage your car’s wheel alignment. If there is a minor change in alignment, it is not a big deal but if the alignment is affected significantly, handling and steering can become difficult. Suspension, one of the most important parts of your car, can also suffer damage as a result of hitting the curb. Damage to your suspension can affect your steering wheel rod, shocks, and also cause the tires to blow out. 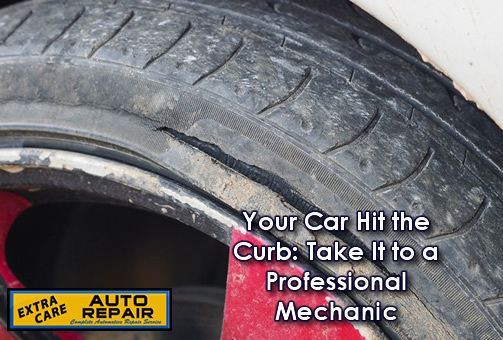 Hitting curbs can also break or bend your car’s tire rods, which connect the wheels to the steering wheel. This increases the risk of poor handling, especially on icy and slippery roads. Your tires can also suffer damage when the car hits a curb. The rims of the tires may end up bending in case of a heavy collision. Moreover, your car tires may burst because of a rupture to the side wall. However, minor impacts can also cause noticeable and expensive damage to the tires. It is important that you do not rely on your instincts about the level of damage after you hit a curb. Only by getting your car checked by a skilled and experienced mechanic would tell you the exact damage. Nevertheless, you should not only take your car to a professional mechanic after the first couple of ‘accidents’. In fact, you should have your car checked regularly.